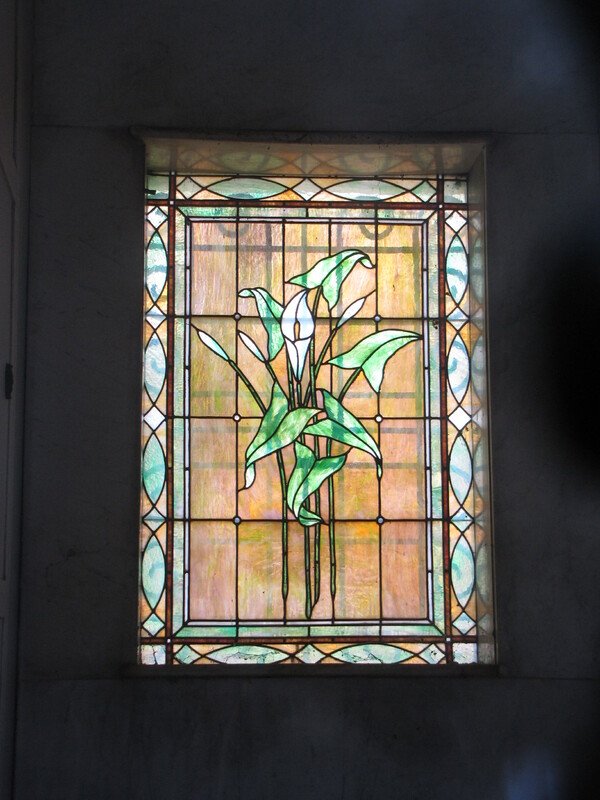 The stained glass window in this Crown Hill Cemetery mausoleum at Indianapolis features a single white calla lily in full blossom surrounded by three stems with buds. The calla lily is a stunner with its long slender stem, brilliant white flowers, and broad leaves. Though it is called a lily it is actually not in the flower family liliacea. The South African native is actually a cousin to the jack-in-the pulpit and is in the family of araceae. In Africaans the calla lily is called the Varkoor, or pig’s ear, because that is what they believed it resembled. The calla lily was imported out of South Africa in the later part of the nineteenth and early twentieth century. It almost immediately became associated with Easter and is sometimes referred to as an Easter lily. The calla lily represents majestic beauty and is often used on funerary art to symbolize marriage. In some cases, they can also represent the resurrection.